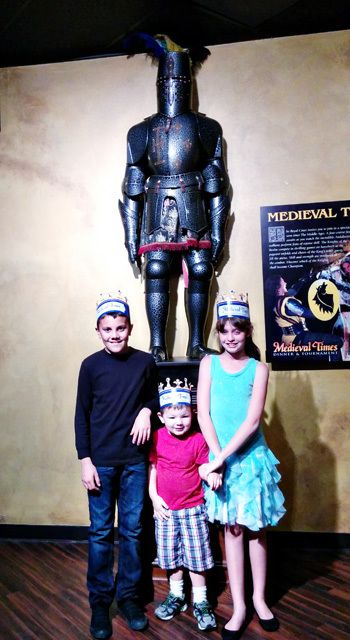 From the moment you are greeted at the castle door with a “Good day, my lady,” Medieval Times will completely transport you to the times of knights and princesses. 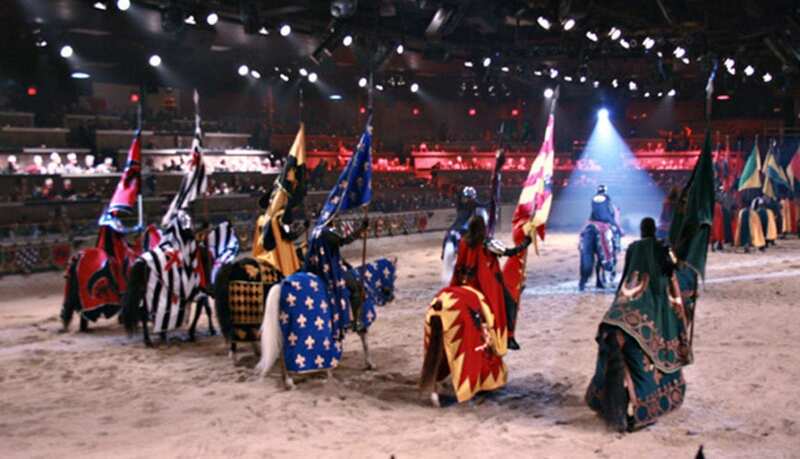 Medieval Times is a live dinner show inspired by an 11-century tournament. The show lasts nearly two hours and includes a four-course feast. 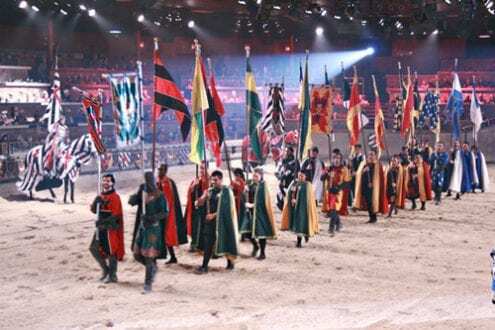 There are nine Medieval Times locations including Medieval Times in Orlando, Florida. This visit took place in Buena Park, Calif. (home of Knott’s Berry Farm and a short drive from Disneyland). Your visit to Medieval Times will begin when you’re given your seating placement and color-coded crown. Seating sections are assigned a knight to cheer for. You’ll be able to take a photo upon entry with a “princess” and given the opportunity to purchase the souvenir photograph. Additional souvenirs are sold in the shopping areas inside the castle lobby. There is everything here, from inexpensive colored flags to wave during the show, sweatshirts with the restaurant logo, all the way up to pricey collectors items in a medieval theme, like swords and chess sets. While you wait for the doors of the arena to open, guests are encouraged to wander the castle grounds. There is a pretty garden outside, medieval artifacts and adult guests can purchase an alcoholic drink from one of the full-service bars. Guests celebrating special occasions (and who have paid for an additional package) are “knighted” by the King in a pre-show ceremony. We enjoyed looking at the horses that are being groomed for the show inside their stables. From your ringside seats you’ll witness all the action. The coliseum seating arrangement is large with seating for over a thousand people. Rows are steeped so your view of the action is never obstructed, even if guests in the row below you stand up. My only complaint about the facilities is that there are no bathrooms located inside the Medieval Times dining area. There is only one exit and it was a long walk around the arena with my potty-training three-year-old to the bathrooms deep inside the lobby. Take a visit before entering the arena and consider that long walk to the bathrooms before indulging in the never-empty drink steins! The action-packed performance begins when all guests are seated and lasts long after dessert is served. Without spoiling any of the story, the show includes falconry, horsemanship, jousting and hand-to-hand battles between the knights. The King and Princess oversee the show from their royal perch and the Lord Chancellor announces the pageantry throughout. It’s all very realistic and entertaining, with just the right mix of beauty and action to please everyone in your group. My 11-year-old son loved the combat and sword fighting. My 11-year-old daughter liked the dancing horses. My three-year-old son couldn’t decide what part was his favorite, he loved it all! I was impressed with the high quality entertainment and all-around fun atmosphere. A hearty four-course meal awaits you, so be sure to come hungry. The delicious food is certainly not an after-thought to the show. Dinner started with warm tomato soup and garlic toast. We each received a large chicken breast, delicious herb-roasted potatoes and an ear of corn. Dessert was a hot apple turnover with a flaky crust. There are vegetarian options available upon request. Our waiter returned often to fill our steins with soft drinks. 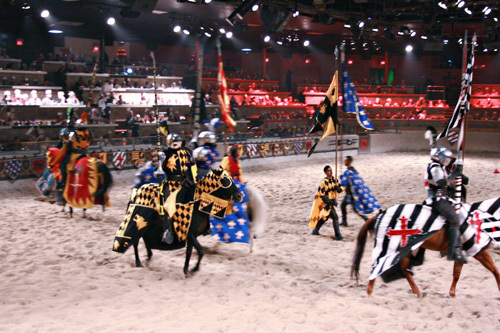 When at Medieval Times, guests eat as the knights did in the 11th century…with their bare hands! Fortunately, we had plenty of napkins. Don’t dress in anything fancy because tearing into the enormous chicken and holding buttered corn does get pretty messy. I was surprised to see that we all received the same large platter of food, including my three-year old son. At the end of the dinner our waiter asked if we wanted to-go boxes for our uneaten food. My kids and I drove up from San Diego for the day, visiting the Discovery Cube OC during the morning and afternoon. 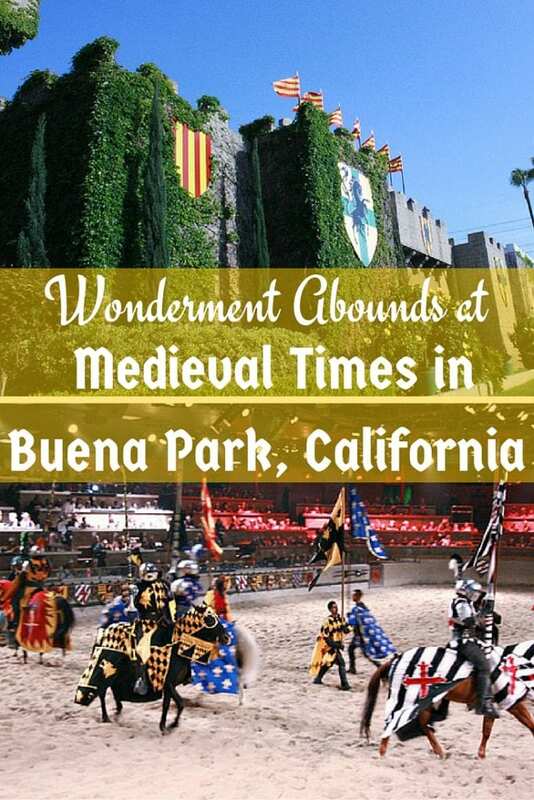 Medieval Times is located about 30 minutes north in the city of Buena Park. 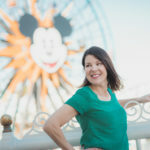 Buena Park is home to Knott’s Berry Farm (which is only a few minutes drive away) and Disneyland (about 20 minutes away). 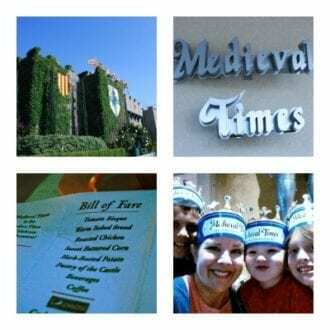 My only thought after watching the Medieval Times show was, “Why haven’t we done this sooner?” It was truly an amazing show, a fantastic dinner and my kids haven’t stopped talking about the experience.